Parents and Grandparents of pre-schoolers and grade school kids, run–don’t walk to your local cinema as “Ponyo” is the film for you! Artistically and visually this film is a gem. It’s a magical story loosely based on the Hans Christian Anderson fairytale, The Little Mermaid and is written and directed by Academy Award winning animator Hayao Miyazaki. The film is voiced by major stars such as Matt Damon and Cate Blanchett; who, no doubt wanted to be on board alongside this genius of a film-maker. You’ll view breathtaking images and brilliant colors that boast a refreshing animation style. Each film frame could easily be the page of a beautifully illustrated Caldecott winning children’s picture book. It’s eye-popping and awe-inspiring cinema at its best. I highly recommend viewing Ponyo on the big screen to fully appreciate the value of this treasure. The stars of the film are darling and delightful little kids that will steal your heart! Ponyo is the name of a goldfish that becomes a girl as she has a strong will and wants to live on land with her 5-year old friend Sosuke. Together this duo is simply enchanting. The film’s setting is an island near the sea, where Sosuke lives with his mom on an oceanside cliff. His dad is a sailor and out at sea much of the time, which in turn, leaves Sosuke to take on the role of ‘little man’ of the house. Sosuke is characterized as protective, smart, sweet natured and instinctive. He takes his role very seriously and his mom and Ponyo have great trust in him. 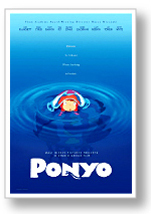 Ponyo is a strong-willed, curious little fish that got into her dad’s potions and discovered a secret to becoming human. Her mom is a beautiful sea goddess and her dad is an underwater wizard. After Ponyo met Sosuke for the first time, she was determined to become a little girl so she could live on land and play with her new friend. Something your children will find amusing about Ponyo is that she has a big appetite and loves ham! Lisa, Sosuke’s mom works at a nursing home and these outspoken ladies are a big part of the story. Betty White’s voice is distinguishable as a member of the wheel chair ladies group and she’s fantastic as always. The addition of the elderly adds a wonderful feel to the film and incorporates a message of importance to this generation, setting a great example for our youth. The underwater sea life is beautifully detailed with brilliant backdrops. Neon jellyfish glow and other exotic sea creatures stream in and out as if we slipped on a diving mask and are taking a peek underwater. The musical instrumental score correlates perfectly with these scenes; crescendoing and moving rhymically to the waves of the sea. Near the beginning of the film, we hear a woman’s voice beautifully signing an opera themed ballad that hauntingly sets the tone for this very special film. The storyline also takes on the issue of the earth’s need to be in balance with nature and we view pollution in the sea and on land. Important issues that will surely send another message to viewers. This smart script has much to say about our world and the desire for nature to live in harmony with mankind. Bottom-line, “Ponyo” is not a little story about a little fish that wants to become a girl; it’s a big story that is also a highly creative film, one that’s sure to entertain your children and send them important messages about respect for the elderly, nature and our world.